One of my favorite food events takes place this weekend. 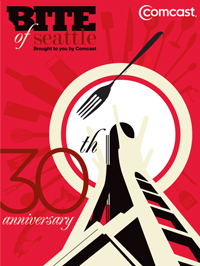 The 30th Annual Bite of Seattle starts Friday, July 15th at Seattle Center. Each year this event gets bigger and bigger. Although one thing is getting smaller this year. All restaurant booths will offer a Just a Bite! item (a smaller portion of one of their popular menu items for a lower price). So now you can sample a variety of restaurants, instead of getting full after just one or two food booths. One of my favorite foods to try is the grilled corn on the cob. The line for this is always dozens of people long, but it's well worth it! Nothing is better than an ear of corn grilled in its husk, peeled, and then dipped in melted butter. YUM!! As always, the Bite will have entertainment for the entire family. Stop by and check it out. This is a great opportunity to try some of the best food Seattle has to offer!